So, I don't have a lot of info to go on with here, but I'm thinking of a couple of figures I had a long time ago that I have very little info on. The two figures in question came on a cake for my birthday! There was a Pikachu [the one in this photo, waving] and a Charmander. Both about 2-3" tall, or thereabouts. They were very thick and solidly built plastic figures. The Charmander looked almost exactly like this, but a bit better painted and afaik, with no hole through the top. Any idea what these could be? 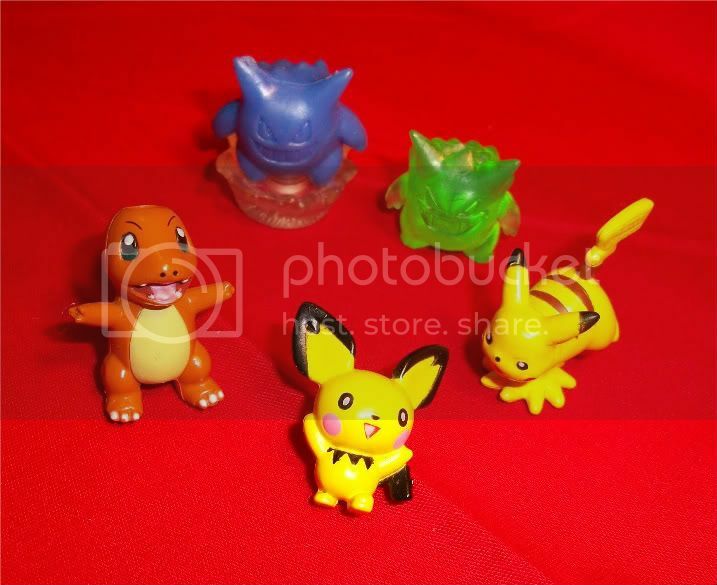 They seemed a bit too high quality to be bootlegs... Any series/collection/etc info, especially on the Charmander? -Swampert, Blaziken, and Sceptile Pokedolls! -ANY bell plush! 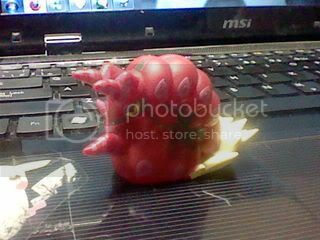 - I'm collecting them all, but the one I'm after the most is Butterfree. In-box is preferred. Just a reminder about my Houndoom and Suicune V Trainer auction! Bidding ends in 10 hours! Click on the image to be transported! My dream hath been fulfilled! Thank you ivan_rathe!! 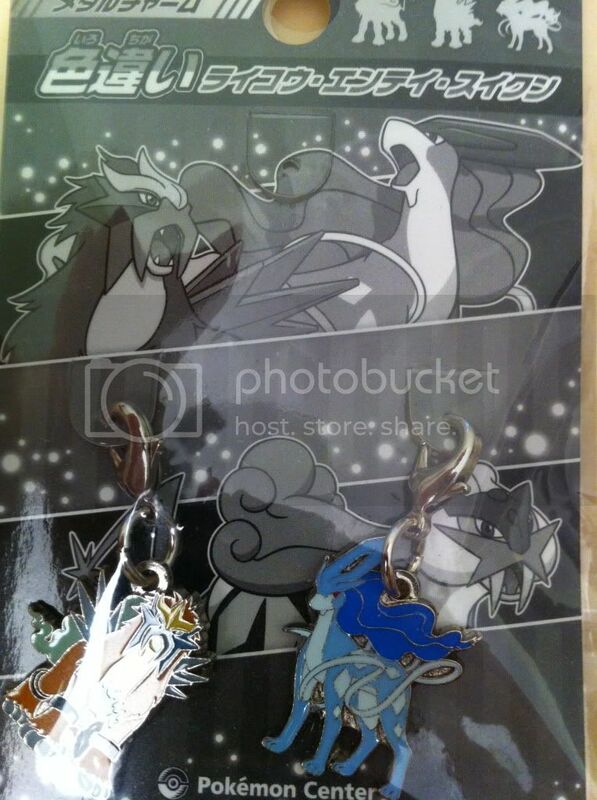 Just a quick reminder that my auctions for shiny suicune and entei charms, as well as shiny magikarp and gyarados charms will end in about 12 hours!! So if you are interested, click HERE!!! When you talk about alternative coloured pokemon, is it more correct to say SHINY? or SHINING? Hi guys! (This is jedi_amara with a name change, btw!) Does anyone have any experience storing plush in space bags (vacuum-sealed bags)? I have a lot of plush and they usually have a bedroom to themselves but due to an illness in the family I have to vacate that room, so I need to put most of them in storage. Space bags were suggested as a good way to save room and keep them from bugs/dirt/dust but I'm a bit worried that the plush will be deformed when I unpack them after being vacuum-packed for a while. I'd love to know if anyone has tried it and how it worked? Or any alternative suggestions? I am also looking for a repainter! I am looking to have some repainted kids and a repainted TFG figure. If you're skilled at this and need some extra $$$, I would love some of your work. I will be willing to supply you with the original kids/figures. If you're interested and have the time, please post with a sample and your price range! Hi Guys! 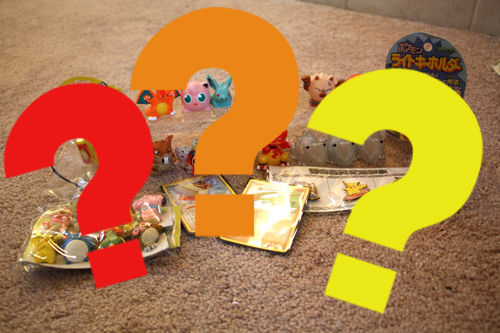 Well I just found a bundle of Pokedolls on a site called kijiji and wanted to ask a few questions?Does anyone know is this site is safe?Also it seems this is like Craigslist,and the problem is the bundle is in Canada.Nepean Ontario to be exact.I was just wondering if someone can help me obtain this bundle who's in this area?I'm not sure if that would be breaking rules,so sorry in advanced. Not been around in AGES! And I promised a re introduction blah blah.. so.. NOTE - i've NOT been getting PM's or notifications for it, so please if youve messaged me, please lemme know ; u ; i feel so bad.. I'm so gonna mess this post up <<; if its messed up let me know! Reminder -Amigurumi Auction - Ending Tonight! My amigurumi auction is ending tonight at 8:00 PM CST, that is in about 3 hours Has now ended! Click here or the banner to go bid. Please make sure to read the rules first! 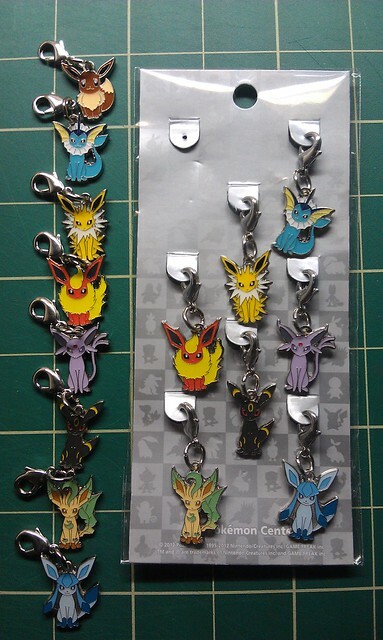 Also, check out my permanent sales post for some stamps, straps, and TCG cards! Hey guys. 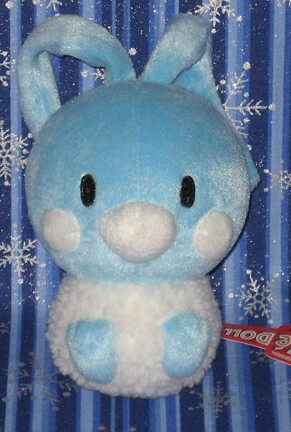 :D I was browsing around looking at pictures of the Meloetta merch and ran across something else new as well. There's some clearer pictures and additional info from the "PokeDoll Stamp" promo. So many cute things. 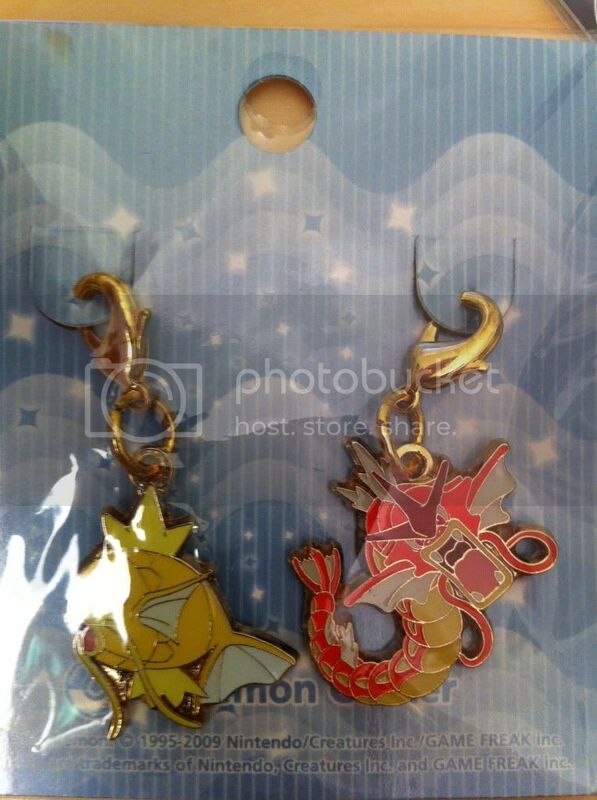 ;o; I like the idea of having a notebook + pen set, and it looks like we're getting randomized pins again. 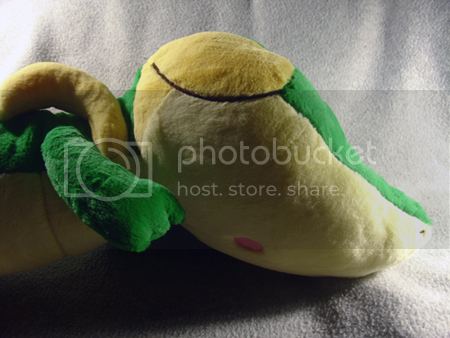 Sup its just me a poke plush GA is in and Sales/Auctions :3. I will be taking everyone's stuff to the post office tomorrow to get weighed :3,mailers are being used unless you specify you want a box ( Some people have boxes already ). Tracking will be free since I'm shipping with paypal :),let me know if you want insurance though. Let me know if you want extras :3. Anything not pictured here I have either claimed for myself,or in the case of wobbuffet has been claimed by my mom <3. Hello Community~ This is my first sales post for custom figure commissions! I am somewhat new to figure making but I love it and hope to share my creations with all of you. For now I am opening up 3 commission slots. It usually takes 1-2 weeks for me to complete a figure, it all depends on what is being made. If you have any questions feel free to ask! -Telling myself "you should remember to make a get post!" I remembered I had some figures and plush which I was curious about and wanted to ask the community's opinion as to what some of them were. 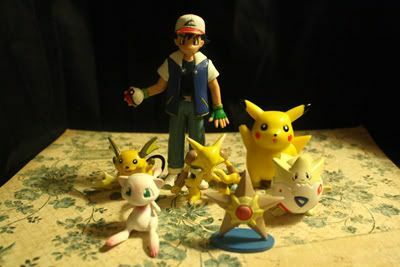 In.. my introductory post I think it was, I mentioned I had an Umbreon V-trainer figure with a chip in it, an Ash v-trainer trainer chip thing, as well as a Rayquaza V-trainer figure. Umbreon i knew enough about but I had no ideas about the Ash chip or the Rayquaza that came with it. A couple members were interested in seeing him, and I finally got Rayquaza here for a picture..! collection update + name change O: !!! Hi everyone! I'm here with a long overdue collection update. For anyone who may remember me, I was originally known as pachisan. To all new members, hello!!!! Hope you're having as great a time here as I had when I first joined! It's been quite a while since I've been active on the community. For anyone who doesn't know me, I am a Pachirisu collector and began officially collecting this cute little squirrel in 2009 after a life-changing trip to Tokyo! I joined pkmncollectors in late 2010 and haven't been very active in the past year. My other favorite Pokemon include Zekrom, Snivy, and Shellder. I also have a fondness for Giratina, Roselia, Spinda, and Glaceon. I try to collect a decent amount of merchandise of all of them. Skymin/Landmin and ETC GA - WE WON! We managed to raise like... over three times the amount we needed, so discounts ROCK this go round! Please feel free to rid me of me not anymore wanted things<3 Follow the plug under the picture! Also there's a meme inside: What would you change about the Pokemon franchise if you had the chance to?